I was working on a Visualforce page that displays the results of a query in separate PageBlock sections based upon a value in the query results. I ran into a small issue which took about an hour or so to solve, so I thought it might make descent blog fodder. Here's the code for the Visualforce page. I've made it as bare as possible but you can see that it iterates over the array of states to display the pageBlock sections and then displays the record if the state matches the current blockSection's state. 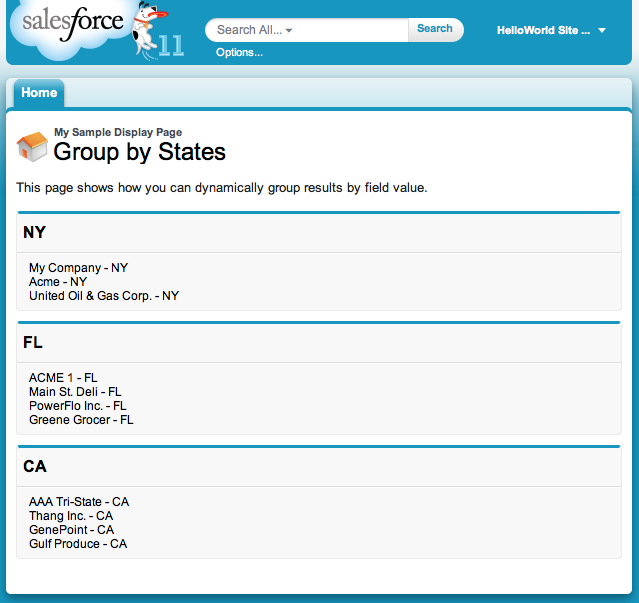 <apex:sectionHeader title="My Sample Display Page" subtitle="Group by States"
The problem is that even though the Set is a collection of Strings, it is actually an object underneath the covers and throws a comparison error. Therefore you have to return the states as an array of strings for the code to compile and run properly.